Methinks…I should sit down with this drama and do what I did with Crazy Love. We open this episode with the Kim family arriving home to find the conniving Saewa in the kitchen. Hye Sook asks what she’s doing there. What does she mean? She lives there. Saewa then happily greets them all one by one and says that since it is cold out she has prepared a hot stew. Just what is Saewa’s goal? She and Do Jin haven’t submitted the marriage registration as of yet… Is she trying to force their hand so they can’t get rid of her? Bongi anxiously waits for Donghae who comes home and says that he is quitting his job at the hotel. Bongi scolds him for giving up after he promised not to. What happened? Donghae doesn’t wish to hurt Hye Sook anymore, plus Saewa’s marriage will only continue to suffer if he stays. Why should he care about Saewa? Plus, what about him making Anna’s dream come true? Donghae vows that he will definitely find his father for Anna, but he can no longer be selfish and keep hurting others. Isn’t it amazing how much Donghae has matured over the course of 60 episodes? I mean…he was never a bad person, but his temper and thinking have really grown up. Donghae then apologizes for coming to live with the Lee family as he is only making them worry. He isn’t leaving their house, too, is he? Donghae doesn’t wish to cause the Lee family pain or make things hard on them. This touches Bongi and also makes her sad. Donghae heaves a sigh and propels her inside since it is cold out. At the Kim family, Hye Sook demands Saewa stop and get out. Saewa won’t. She wanted to cook dinner for the family. Family? What family? Saewa was kicked out of the house. She knows Hye Sook only did that out of anger and didn’t mean it. Before Hye Sook has a chance to blow up at her hated daughter-in-law, Kim comes in and sends the maid out and tells everyone to calm down and meet in the living room to talk. They sit down and Hye Sook says she’s already resolved things with the lawyer. They have no marriage certificate and Saewa has no ground to sue for alimony, but Hye Sook will give her some money if she wants. Saewa then reaches into her purse and hands over a copy of the marriage certificate. Saewa submitted it that very day. She married Do Jin because she loved him and will not let the marriage end just like that. Does Saewa really wish to take the matter to court? She won’t win. Saewa smiles. Hye Sook’s lawyer should know that her past is no grounds for a divorce so getting one granted will not be easy. Plus, think about all the gossip if it goes that far. Hye Sook picks up the marriage certificate. Saewa’s threatening her with that piece of paper? There is more than enough grounds for divorce since Saewa hid Donghae in the hotel and snuck around with him after marriage. Saewa says that isn’t true and all just a misunderstanding. She calls herself a victim and Donghae a stalker. Lying wench. Saewa tells her mother-in-law to eat and rest and goes upstairs. Hye Sook pops up mad, but Kim stops her from running after Saewa. Do Jin goes to their room and Saewa smiles and hands him pajamas. He throws them down and asks if she has no shame. Saewa says while she may have dated Donghae, she did not hide him and, in fact, tried her hardest to get rid of him to protect her marriage. She then says the mere fact she had a boyfriend before they married is not grounds for the treatment she’s been receiving from Do Jin and his mother. Saewa then tells him to listen to her. Donghae is out for revenge for her choosing Do Jin over Donghae. Does Do Jin really want to end their marriage and play into that man’s hands? I wish to strangle that woman. Do Jin then rushes out of the house. Hye Sook then comes up and grabs her son’s pajamas from Saewa. Does Saewa really want to start something with her? Of course not. She doesn’t wish to upset her mother-in-law at all. She really has no shame. Saewa again reiterates that she is part of the family as Do Jin’s wife and Hye Sook’s daughter-in-law. She’s not going anywhere—she refuses. Hye Sook then vows to make Saewa leave of her own volition. Saewa also vows she will never leave. She grabs the pajamas back and says that no other woman is allowed to touch her husband’s underwear—even Hye Sook. This makes Hye Sook livid, but her husband comes in and drags her out after yelling at Saewa for making things worse. They leave and Saewa vows to endure. Hye Sook goes to throw her out and Kim says that she needs to calm down as there is nothing to be done tonight. But Hye Sook doesn’t want Saewa there. It doesn’t matter as Saewa managed to claw her way back in only a week! She’s no average girl. Besides…this should ultimately be Do Jin’s decision. No. Since it has to do with their son’s life, it concerns them, too. Well…yes, it does, but Kim is right…it is ultimately Do Jin’s decision. Kim also doesn’t want Hye Sook to wear herself out and promises they will find a way to make things right. Sool Nyeo worries anxiously in the apartment when she finally gets a call from Saewa saying she has successfully infiltrated the house. Saewa then says that her mother needs to stop Anna from going anywhere near Kim. The rest Saewa will take care of. Sool Nyeo then sits down and complains that she has more trouble now that her daughters are married than when they were single. Sool Nyeo then complains Anna is out to ruin her life. Omo. She’s just as bad as her daughter—always blaming others. Tsk, tsk. Donghae goes into his room and Anna shows him the scarf she knit for James. He compliments her on her skills and then says that he may have to quit. Why? Did Hye Sook tell him to? No. 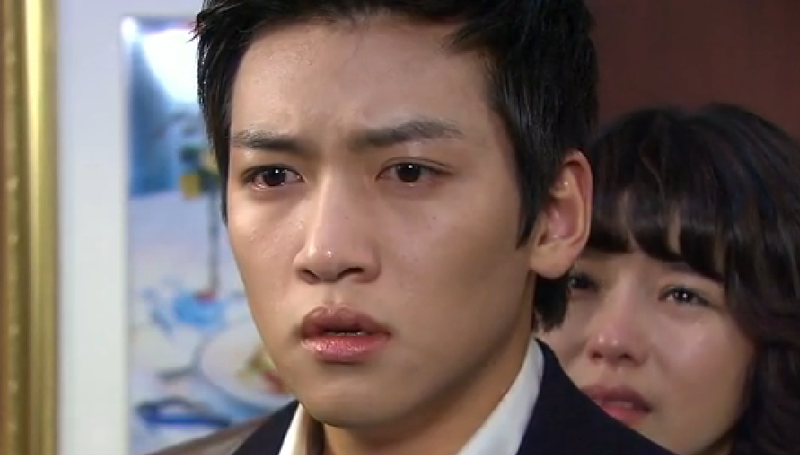 He just doesn’t want to hurt Hye Sook any longer. Anna agrees since Hye Sook is a good person. Thus, Donghae should quit. This hurts Anna as this means it will be harder to find Donghae’s father, but since she doesn’t wish to hurt Hye Sook, she can only agree. Donghae hugs his mother to him. Bongi was listening outside the door and tears up. Sun Ok goes to see what is wrong, but Kang Jae stops her. She then goes to the kitchen where she dices meat and vows that she won’t let Donghae leave. Her parents come in and ask what is going on? Why would Donghae leave? Does he and his mother have some problem? Thus Bongi confesses the whole story to her parents who are in utter shock. But…certain things now make sense. This is why Sool Nyeo came over and kept bothering Anna. Kang Jae asks if Saewa’s in-laws really know. Yes, and that’s why Donghae is thinking of quitting. Sun Ok says she can’t blame the Kim family as such a story would hurt their reputation. This earns her a scolding from her daughter. Sun Ok says she isn’t taking sides, but telling it like it is. Kang Jae feels badly for Donghae who must be having a hard time with this situation and trying to find his father. Correct. Donghae sits up and watches his mother sleep. He apologizes to her and vows that he will find his father no matter how long it takes. The next morning the Kim family goes in to eat breakfast and are greeted by Saewa. Hye Sook angrily leaves and Do Jin follows suit. Kim asks why Saewa is trying to solve matters like this as it is only making things worse. She should be calmer and not get so emotional. Saewa pouts a bit and then goes upstairs. she hands Do Jin a red tie to wear as it will be more festive. Do Jin ignores her and grabs a different tie. Fine. She goes to pick out his jacket, but he stops her and grabs one out and shoves her out of the way (he seems to feel badly about doing that, but says nothing and leaves). At the hotel, Hye Sook tells him not to be swayed and keep his head on straight. Do Jin goes into his office and thinks over what Saewa said about Donghae seeking revenge. Will he believe his wife? I do feel a teensy bit sorry for him, but not by much. He and Saewa created this mess together. Him by insisting he have a girl with a clean past with no man in her life save him and Saewa by lying and seeing him while she was still technically with Donghae. Bongi reveals she told the truth to her parents. Is that okay? Donghae then apologizes for causing trouble and Kang Jae assures him that it’s okay as he is going through a hard time. Of course, Pil Jae has no idea what’s going on and every one insists he doesn’t need to know as there is no way for him to help the situation. So what will Donghae do? He will give up the competition. He wants to find James for his mother, but does not want to hurt people. Anna cries and agrees with this. Donghae then declares he will quit his job and start over. Kang Jae and Pil Jae both offer their support and Donghae thanks them. The unhappy Bongi rushes out of the house and Donghae runs after her. Saewa is unhappy to learn that Kim Joon will really take up the anchoring position. What will she do as Anna will most definitely see him on TV. The PD for the cooking program rushes up to her—doesn’t she know that she needs to report to the Camellia Hotel? Yes, she will meet up them later as she has an errand to run first (involving Donghae or Anna or something like that). Donghae catches up to Bongi. What is wrong? She’s unhappy that he said he’ll quit the hotel to start over. What does he mean? Just that. He has been too one-sided in thinking of the hotel as a solution to find his father. Bongi doesn’t see what is so wrong with him staying there since he loves cooking and wishes to find his father. Donghae pleads with her to understand. He doesn’t want to make the situation any worse and hurt the people who have shown him kindness as it is not right. Oy, Bongi. She gets angry every time Donghae says he’ll start over. Go to a place where no one knows him to look for James? To leave the Lee house? Donghae again asserts once more he doesn’t want to hurt her family. Fine. Do what he wants. But if he leaves the hotel and their house, Bongi will never see him again. Bongi’s attitude here is really frustrating. Why can’t she grow up a little? Saewa believes the only solution to her problem is to get Anna out of the country. She tries calling Donghae, but he doesn’t answer. Why would he? Meanwhile, Sool Nyeo lies in bed bemoaning her bad luck. She then decides she needs to get rid of the source of all problems—Anna. She digs for her bank book when Sae Young comes in begging for money for clothes and lotion. Sool Nyeo is livid. Saewa’s marriage is on the rocks thanks to Sae Young and she has the gall to ask for money for clothes and lotion? Sool Nyeo then pushes her youngest daughter down and says that even paying for food for her to eat is a waste of money. Sae Young storms into her room and Tae Hoon shushes her as the kids have just fallen asleep. Sae Young asserts she can no longer take it and wishes to move out. On what money? Tae Hoon can barely afford their babies’ formula let alone pay rent. Is Sool Nyeo yelling at her again because of Saewa? Sae Young then repeats what her mother said. Sae Young tells Tae Hoon to become a success so she can shame her mother. No…better yet…she will get a job. How long will this resolution last? Saewa goes to the hotel where she immediately pounces on Donghae. Why didn’t he answer his phone? Is he still thinking of that stupid competition? Donghae says that she may think its stupid, but its really important to him. Thanks to her he lost all chances to compete. Donghae goes to leave, but Saewa drags him with her. Of course, Do Jin witnesses this and follows. Saewa again asks him to play the part of a stalker. Donghae is livid. He’s quitting the hotel already. It’s bad enough that Do Jin hates him. Now Kim and Hye Sook think he’s an awful person and Saewa wants him to act like he’s crazy just so she can put on an act in front of her husband? Shameless witch indeed. How come the Kim family can’t see how much Saewa has victimized our poor Donghae? Saewa says he can do that much for her since she is the only one who knows where James is. However, Donghae won’t bite. He refuses to listen to or believe Saewa. Enter Do Jin who vows to never forgive them for lying about breaking up. See what your idiocy causes, Yoon Saewa? Bongi is all depressed in the hotel kitchen. Yoo Jin asks after Donghae and says she can’t cook to her best ability without him. Bongi slams down her knife and refuses to let him go and rushes out. Meanwhile, Anna sits at home all depressed. Pil Jae comes out and tries to cheer her up by inviting her out to eat some good food. Anna refuses as she wants to be there for her suffering son. Pil Jae says eating good food and bringing some back to Dongahe will be good so Anna reluctantly agrees. The two go in to change and Sool Nyeo enters. Anna then says she didn’t ask Pil Jae to buy her food and she won’t be going. Sool Nyeo says she understands and tells Anna to be quiet. What is she up to? Donghae climbs the stairs to hand in his resignation letter when Bongi rushes up. What is he doing there? She then sees the letter and starts crying. Donghae pats her back and continues on. Back at the Lee house, Sool Nyeo hands money over to Anna and asks her to listen. Anna says she will do anything for her son and begs Sool Nyeo to not hurt Donghae. Sool Nyeo says that is just how she feels about her daughter. She then begs Anna to take Donghae and go back to the US. Anna says she cannot because they need to stay and find James. Sool Nyeo then lets it slip that James is Saewa’s father-in-law. Good job! Dae Sam sees Donghae upstairs and wonders why he’s there instead of helping during this busy time. Donghae replies he needs to speak with Hye Sook. He then thanks Dae Sam for everything. Dae Sam finds this odd, but shakes it off and goes to the kitchen. The elevator opens Donghae gets in only to have a crying Bongi stop the doors from closing to get on with him. This shocks him. Bongi goes to the back of the elevator. Is he going to resign? Yes. Bongi tells him not to leave. Donghae goes to turn around, but Bongi stops him. She begs him not to leave because she likes him…no loves him. So can he please not leave? Finally!!!!!!!!!!!!! Bongi confesses and Anna learns the truth. What will happen next?